The Conservation College Wildlife Conservation & Tracking Instructors training internship position is an exclusive summer focus of our Earth Skills Apprenticeship with only two positions available in this, our 20th Anniversary Year. Check out all the general program details for 2017 on our main Earth Skills Teaching Apprenticeship page. For instance, if you can find a perfect rock to use as a bowl, you don’t have to spend a week making one that holds water. Think of anything: if you can find it, you save the time to make it. In order to track, you have to “know your place,” learn the hazards, develop heightened senses, and be able to remember (record) findings accurately. And whether you join our team for the purpose of research, teaching, or sport, you will be well on your way to becoming a highly valuable wildlife guide. In one summer, you can become a professional tracker and wildlife conservation instructor through this full time, residential apprenticeship at Wolf Camp and the Conservation College with travels into the North Cascades Mountains, Central Washington Canyonlands and Pacific Coast Wilderness. Each week of the summer is an intensive study on a different aspect of the animal kingdom, including skills to understand “sign” while tracking animals, skills of “trailing” to catch up to the animals, opportunities to get evaluated by Cybertracker, Int’l, and help finding work in the field of wildlife conservation. 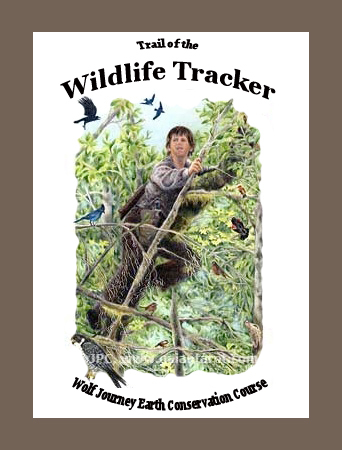 FAQ – Which Outdoor Skills will I specialize in as a Wildlife Conservation & Tracking Instructor intern/apprentice? Note: Vertebrates are animals that generally include fish, amphibians, reptiles, mammals, and birds. Invertebrates are animals without a backbone, and trackers limit their pursuit to those which can be readily seen and followed, including Annelids (earthworms, leeches), Arthropods (insects, arachnids, and crustaceans), and intertidal life (shellfish, jellyfish, starfish, anemonies, urchins, squids).